The Hair Repair Kit from A'Kin treats and repairs dull and damaged hair in need of some TLC. Combining their gentle unscented conditioner with the Intensive Moisture Masque, hair is left feeling hydrated, smooth and silky soft. Deeply soothing and fragrance free, it is perfect for sensitive and fragile scalps. 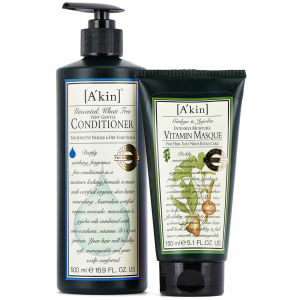 A’kin Unscented Conditioner boasts certified organic shea butter, nourishing Australian certified organic avocado, macadamia and jojoba oil combined with anti-oxidants, vitamins B5 and oat protein so that with regular use, those with sensitivities and irritations are likely to experience symptomatic relief. A treat for all hair types, this Intensive Moisture Vitamin Masque restores moisture, manageability and strength in just five minutes. It’s richly nourishing and protecting ingredients will leave your hair smooth and shiny. Australian jojoba oils combined with rice amino acids, wheat protein, anti-oxidants including white tea and ginkgo, and vitamins E & B5 to help restore strength, flexibility and lustre to all hair types. After using A’kin shampoos, massage gently into the scalp and hair. Leave for several minutes to allow the nourishing ingredients to penetrate. Apply generously and massage gently into both hair and scalp. For an intensive treatment, leave for 30 minutes to overnight.